Today’s subject is – searching lost or missing files on your PC. For example, you have saved some file on your hard drive, but unfortunately forgot where exactly. Windows provides you a function of “lost” files search. You may find it in some ways, depending on the information about the file you posses. So, to launch the search machine, click “Start”, then “Search”, then in the sub-menu – “Files or Folders”. The machine may find your file by some criterion, depending on what you know about what you are searching. Users of File Search Assistant software can choose “Find missing files wizard” in File menu. Open the searching application, in the left column there are some text fields, subscribed to help you where and what to enter. So, you remember the file name, type it in the upper field the file name. Computer will search all files, having similar names, and list them all in the right column. The wizard will help you to formulate your search query and search mask by asking several questions. In the middle field type some abstract you remember from the text. Computer will search all text files, containing the text you have input. And all found files would be listed in the right column. The wizard will suggest you to enter several keywords. So, you can use the Search settings, choose the “Date” field, type the required date there, and computer will show you all files and folders concerning that date. It’s really useful when you, for example, work with some file, and after some days forget where it’s saved. But you remember the date, so, you can easily find it! The wizard will help you to specify the date interval. Probably the file that you are looking for was created this month. Also you can find data you need using this utility, if it’s located in the local network. For example, you have browsed some computers in your LAN, and found some .mp3 file. Other day you decide to listen to it again, but you don’t remember exactly the computer’s network name. The wizard will ask you for a location to search in. You cannot use the “Find” utility when there are too many files on you drive cause it takes too much time to find something. File description is not shown in the “Search results” window, it’s not convenient sometimes. And you may not select several folders to search in – only drive or single folder, often it gives too approximate results. You can add some custom search options and custom search group to make your search effective. Previewing file description allows to save your time while searching. Search Missing Files Wizard (in File menu) will guide you to the best search results. The market is full of file search programs, but while some of them are very expensive and cannot fit your budget, others are very difficult to use as they require special IT knowledge. File Search Assistant would be the best choice. This program is developed by AKS-LABS, a company that always makes difficult things understood for ordinary PC users. File Search Assistant is a simple program that guarantees excellent search results. Let’s review some of its key functions. File Search Assistant has a preview function which will save you much time. How? It is simple. The program may find 20 files fitting into your keywords and search criteria. But the problem is that you need only 1 or 2 files. With preview mode you do not have to open all the files to have a look at the texts. Just click on any file and review context in which keywords are used. 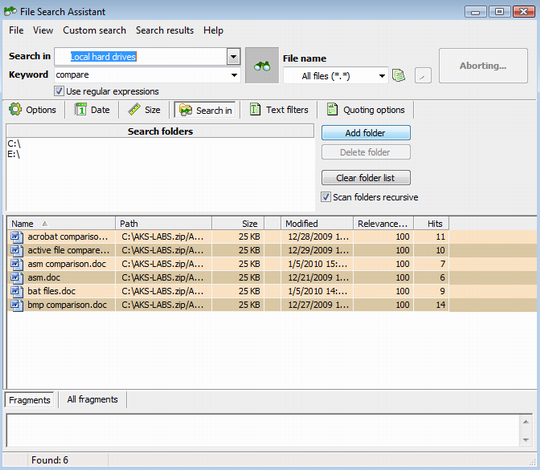 File Search Assistant offers such search criteria as search by date, size and mast. All of them are very important since they can narrow search results. Search by mask implies looking for a particular file type. There are also case sensitivity, quoting and text filter options aimed at providing you with the most accurate results.